Getting in shape is as much mental as it is physical. The body always follows the mind so whatever the mind projects, the body responds in kind. Arnold always said that he didn’t have “will power” as much as “want power”. When you want to achieve a goal, you don’t have to force yourself to be disciplined, you actually want to do the things necessary to be successful because of your desire to accomplish that objective. Motivation does not have to be a training partner or a personal trainer screaming in your ear to do another rep. You don’t need to watch one of the “Rocky” sequels before going to the gym or have your favorite playlist playing on your headphones in order to motivate yourself to do another set. These external stimuli may help provide energy and motivation for your workout but true motivation is more internalized and personal. Achieving a goal and staying motivated can be understood by breaking the process down into a series of steps. The first step is to set a goal. This first step is aided by the process of visualization. The next step is sticking to a set routine followed by the final step which is feedback. When you set a goal, you are externalizing your desires to the world. We all have thoughts and dreams that float around in our heads every day. But setting a goal, writing it down and telling everyone about it is the first step toward making your dreams and hopes a reality. Relating this process to physical fitness, if you have a desire to get into better shape, setting a definitive goal is the first step toward making that dream into a reality. The more specific the goal is, the better the results. For example, setting a goal of losing 20 pounds and decreasing your waist by 5 inches is much more specific and target oriented than saying you want to just lose weight. Knowing exactly where you want to go and how much you have to accomplish to get there helps to make the goal specific and exact. In order to achieve your goal, you have to accomplish those guidelines you set up. Anything less and the goal is not achieved. Having those specific numbers in front of you will help you to objectify your goal, removing the emotions and subjectivity from it. If you have a non-specific goal of just “losing weight” and you begin your diet and start to get some results, you may look in the mirror (subjective evaluation) and feel that you are doing well. This emotional feedback may result in you loosening up the reins and not pushing forward as much with your diet and training. However, if your goal is to lose 20 pounds and you’ve only lost 10 pounds so far (objective evaluation), you will remain motivated to stay on your diet because you know you are only half way there, no matter how good you may look in the mirror. So, step one is to think about what you want to accomplish. When you have a specific goal in mind, write it down. For example, “I want to lose 20 pounds and five inches off my waist and I want to do it in the next four months”. Stating exactly what you want to achieve with objective criteria and when you want to achieve it will get your mind to start thinking about what you need to do every month, every week and every day in order to accomplish your goal. This new mindset will allow you to consistently stay motivated, no matter what is happening around you on a daily basis. Visualization is the process of seeing your goal take place before it actually does. It can be called “active daydreaming”, imagining yourself in the finished position of where you want to be. Many top athletes routinely practice the art of visualization as they “see” themselves winning the sport they participate in. Whether it’s the football player catching the long pass and making a touchdown, the baseball player hitting the big home run or the bodybuilder standing onstage in peak condition doing the perfect posing routine, visualizing in your mind’s eye the finished product helps to prepare your mind to achieve your goal. Arnold (picture above) was the master of visualization and he used this technique quite often, not only in his bodybuilding career but also in achieving goals in other areas of his life. 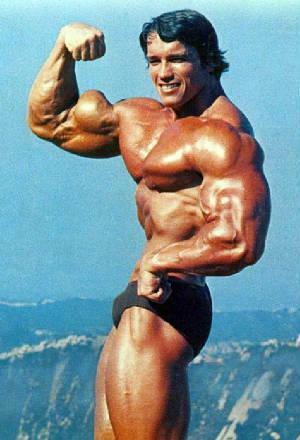 When Arnold was training in the gym, he would visualize his muscles growing to huge proportions. He saw his biceps looking like a mountain instead of just a normal muscle. Seeing his body as larger than life was a big factor in allowing Arnold to be the greatest bodybuilder in the world. Tom Platz (picture above) is another champion bodybuilder who used the power of visualization to push his body to new heights. Tom is known for having some of the biggest legs in bodybuilding. He developed those massive legs through intense workouts utilizing the squat. In order to push his workouts to the next level, Tom would visualize each workout for days before his actual leg training session took place. Visualization can also help to motive you to stay focused toward reaching your goal. By “seeing” yourself looking like the finished product, you are looking toward the finish line instead of where you are at right now. Losing fat and building muscle is a process that takes time. The months and years of training and dieting can seem endless and become frustrating. By visualizing your body looking like you want it to be, it will provide hope and help fuel your motivation to stay dedicated to your workouts and diet plan. Human beings are creatures of habit. When someone starts a new diet or workout program, the initial reaction is resistance because it is a change to their normal lifestyle. Changing the way we eat or going to a gym to force our bodies to exercise can be changes that are initially more challenging mentally than physically. In order to reach your goal and stay motivated, it’s very important to set up a routine for yourself regarding your training and diet program. Knowing what you are going to eat every day and at what times will help establish guidelines and give you a sense of order for your new eating plan. If you can follow this new routine for a few weeks, you will eventually get used to eating these new foods and regular times and it will become part of your routine. The key is to stick with the program every single day for the first couple of weeks in order for your mind to get used to the new routine. This is also important in regards to your workout program. Whether you are working out every day, three days on, one day off or only four days a week, it’s critical that you have a set workout program detailing exactly what you are going to do every day. This strict routine is more important mentally than physically. By knowing exactly what you have to do (exercises, sets, reps, weight) before you do it, it will motivate you to get to the gym and get through your workout without any distractions or excuses. Having goals on what weight to lift or what you are going to do with your workout each day is also just as motivating as having a training partner. For example, if your goal for your next chest workout is to do dumbbell bench presses with 80 pound dumbbells for 3 sets of 8 reps, you will be motivated before even stepping into the gym. Your adrenaline will be pumping because your mind is getting your body ready for the challenge at hand before the workout takes place. 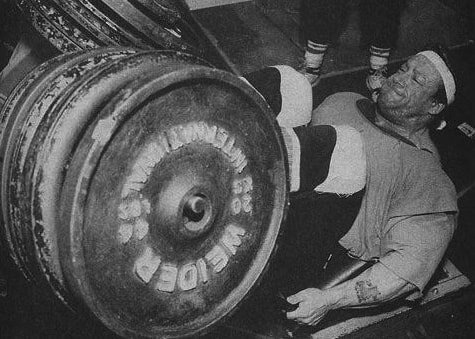 Dorian Yates (picture above) practiced rehearsing his workout mentally before going to the gym. Dorian was meticulous about keeping a training notebook to record each one of his intense workouts. In order to make progress, Dorian would write out exactly what he wanted to accomplish for his next training session. On the day of his workout, Dorian would go over these notes and visualize himself using the weights for amount of reps he wrote down. When he eventually got to the gym, Dorian knew exactly what he was going to do in the workout that day. Before you embark on a new goal, take the time to write up a training and diet program that will help you reach that goal. The workout and nutrition are the framework for creating the new body that you are seeking. The motivation and goal is the start point but without the basic building blocks of nutrition and training, it will be impossible to reach your objective. The last step in helping you to reach your goals is a proper feedback system that will allow you to assess if you are making progress. Blindly pushing through a training and diet program that is not working is as counterproductive as not doing anything at all. It can be extremely frustrating to work so hard and not make the progress you need to make to reach your goal. As mentioned at the beginning of this article, it’s important to set up some objective criteria to measure progress as you begin your training program. Relying on comments from friends or even looking in the mirror will not always allow you to accurately assess if you are on the right path. Objective criteria like your bodyweight, tape measurements and recording calories and macronutrients will allow you to gather feedback that can help you make adjustments to your training and/or nutrition in order to keep progressing. 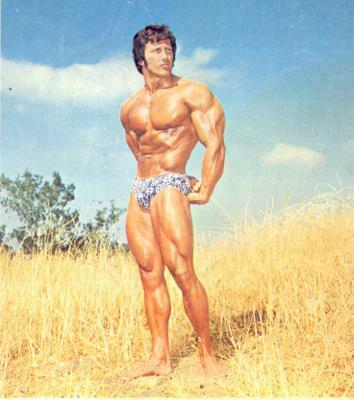 Frank Zane (picture above), three time Mr. Olympia winner, would take photographs of his physique as the contest got closer. Zane would do the same poses and stand in the same location at the same time of the day (he would take his photos outside in the natural sunlight) in order to ensure consistency between the photos. With all the criteria the same, Zane would be able to accurately assess his physique on a week to week basis to make sure he was making progress. The body can change as it begins to lose fat or gain muscle. The metabolism can slow down if too much work is begin performed or not enough calories are being consumed. Your body can easily reach a plateau and resist change no matter how strictly you stick with the diet or training program. By recording exactly what you are doing along with measuring your progress, this information will help you to gather the data needed to make changes and keep progressing toward your ultimate goal. Motivation Tips & Tricks You Need to Make Resolutions a Reality!